Home > Shop by Manufacturer > Aratron II Electronics, Inc.
Touch pad safe condition = less than 10 megohm. Mounting belt clip or bench mount. Visual alarm dual color LED indicators: green = safe, red = fault. Audio alarm piezo buzzer – continuous for 3 seconds (nom). Safe condition 6.5 megohm or less, 180pf in series with 1 megohm. Power supply 9 volt battery. Operator safe condition = less than 10 megohm. Power 115 VAC, 60 Hz power pack. Mounting velcro (supplied) optional bracket. Bench mat safe condition = lLess than 10 megohm. 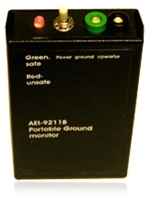 Visual alarm dual color: LED indicators: green = safe, red = fault. Operator safe condition = less than 10 megohm down to 1 megohm. Bench mat safe condition = less than 10 megohm. Power 115 VAC, 60Hz power pack. Visual alarm dual color LED indicators: green = safe, red = fault or yellow = fault. Operation automatic, unit is activated when operator plugs wrist strap connector into jack.